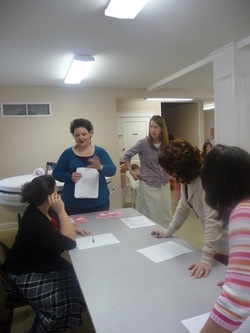 Our meeting this month was entitled “Stages of Life” It was a very lovely meeting. One of our dear ladies, Mrs. D. Smith put it together. She had several ladies decorate a table to represent a different stage of life. Food was served that complemented that stage of life. 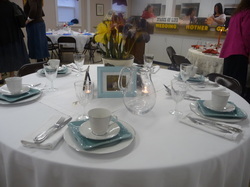 This table was decorated by our baby shower coordinator. She put cheerios on the table since she knows moms often give their babies cheerios to keep them satisfied or occupied. She also served pear sauce in baby food jars. It was really quite good. This table was decorated by a lady who has two small children , a girl and a boy. 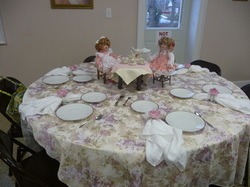 She has already enjoyed “tea parties” with her children so decorated her table along that theme. She served cucumber sandwiches and herbal tea. This table was decorated by a lady who is just starting to get children into their teen years. She did a super job decorating with a lot of cute ideas. There was bubble gum in the center piece and decorated coke bottles for drinks. Mini pizzas on English Muffins were served. Almost all teenagers like pizza and so do adults. 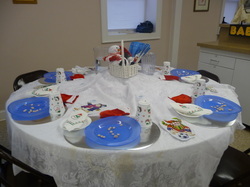 This table was decorated by a lady, Mrs. D. Meyers who has children fast approaching this stage. She also often coordinates and/or decorates for weddings. She always does a beautiful job. She even had a little wedding cake decorated in order for it to be served at our meeting. 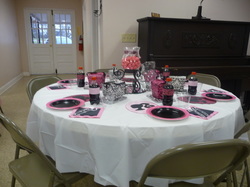 This table was decorated by our preacher’s wife, Mrs. R. Camp. 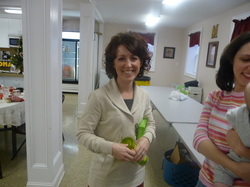 Two of her daughters assisted her since she was also our speaker for the day. They used china that their mom had received for her wedding and also other home decorations. Irises were places as a center piece since Mrs. Camp’s mom had always grown them and had passed them on to her. Some of her irises are around 200 years old. A delicious salad was served. 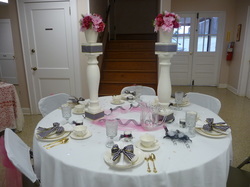 This table was decorated by the lady who put this meeting together, Mrs. D. Smith. She is a grand mother of 22 and a great grandmother of 8 or maybe more. 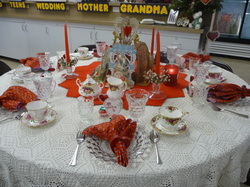 She decorated her table with antiques including some valentines that belonged to her mother from the 1920’s. They were pretty awesome. She also had a small Christmas tree with wooden photo ornaments of all her grand children. Cookies, Coffee, and Punch were served. Diaper a Doll, for the mom stage I am sure; they raced to see who was the fastest. (sorry, not pics) The last thing they did was write a chocolate chip cookie recipe from memory. The one that was the most accurate was the winner. A good prize was given including a Chic-fil-A gift card and a nice water glass, and I am not sure what else was included. Congratulations to my daughter-in-law, Mrs. L. Lockhart for winning. Our speaker that day was our preacher’s wife, Mrs. R. Camp. Of course her topic was Stages of Life. You can read her devotional below. Solomon tells us here that “to Everything there is a season. There is a time and a purpose for everything. He speaks about both the joys and the difficulties of life. In life there are always positives, and there are negative in each stage as well. Our lives are balanced by positives and negatives. God knows if we only had one or the other we would never learn to appreciate them both. The sorrow and disappointment in hard times is softened by the joy of happy times. The times and seasons of life consist of both. Springtime – the season of excitement and fun and growth. What a wonderful time of life! It is a time of discovery. It is a season of fun and is basically carefree. There are almost no responsibilities. Children can enjoy good health (generally) and LOTS and LOTS of energy. Obedience to their parents and expanding their horizons are the only expectations we have of them. And that’s the way it should be – because they are children. But just as there are these positives, there are also the negative aspects of the springtime in our lives. Children can also be fearful and insecure. Their immaturity and inexperience makes them totally dependent on others. That can be very frustrating for children and parents. They must rely on others to make decisions for them in just about everything. As springtime approaches summer, so do children approach the teen years. With good health and energy it is indeed a time of growth and opportunity. Responsibility is usually still at a minimum and there are so many fun and exciting things to do. There are people to meet and places to go. It is a time of social interaction. New relationships are formed, friends are made. A career and/or education is to be considered. But because they are neither children or adults and they lack maturity and experience, this can be a very difficult time as well. It can be a time of insecurity, a time of doubt with so many distractions, their judgment may be somewhat clouded. This is a season in their lives that they begin to make important decisions, which may affect their entire lives and shape their futures. It is a dangerous time in their lives if they do not focus on spiritual things, and look to God (and parents) for wisdom. Because they are learning to grow up and make decisions, it is often a difficult time. Young people will sometimes focus on passing pleasures rather than God’s eternal values in their lives. The next season in life is Adulthood. This is generally centered around family. It is also a time of good health and opportunity. It is a season of establishing and a time of teaching. A time of extreme activity. There is something to get done! It is a time of labor, that God will give so much joy and satisfaction in, if we accomplish them with the proper attitude. Adulthood is a time of so much responsibility that we sometimes get too caught up in busyness that we don’t take time for God. If we are too busy for God – WE ARE TOO BUSY! There are so many interests and opportunities that come our way in this season of life that can distract us of the truth that we are responsible to God every day. We need to be encouraged and rejoice in every day, but remember that we are responsible for our action in very stage of life. Sure, we have overwhelming time schedules, we have stress and pressures, we sometimes have so many problems, concerning work or finances, or other things. We sometimes feel as mothers that we are taken for granted and unappreciated. Proverbs 31:31 Give her of the fruit of her hands; and let her own works praise her in the gates. But determine to see the blessings. God will bless us if we keep a right relationship with him. He will help us be the godly wives and mothers we were meant to be. 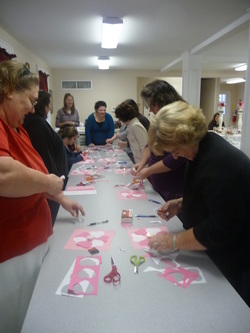 He will help us to be the creative homemakers and blessings to our church and our friends and neighbors and husbands. He will help us to be the wise woman who buildeth her house as Proverbs 14 :1 describes. Proverbs 14:1 Every wise woman buildeth her house: but the foolish plucketh it down with her hands. As summer turns into fall we experience the Empty Nest stage of life. The children have all flown away and the house is now empty. The positive are: the house is easy to keep clean. Usually your health is still pretty descent. You have time for others, you can be involved in many different interests. There usually are not as many distractions in your life or as many interruptions. You have more time with your husband. It is a time when you can enjoy your grand kids, BUT YOU GET TO SEND THEM HOME! You are seeing the fruit of your labor if you have lived your life thus far according to God’s plan. You are now reaping the benefits of raising your children God’s way. 3 John 1:4 I have no greater joy than to hear that my children walk in truth. On the other hand if God’s plan was not followed in the home, it can be a time of regret and disappointment and loneliness. I think one of the hardest things about Empty Nest is a lack of purpose. You have spent your whole life either in school, at work, in the home, raising children and now you have time – too much time, for yourself and you don’t know quite what to do with it. So it can be a lonely time unless constructive ways to use the time are found. We can take advantage of this extra time to study God’s Word., to help others and we also have extra time to pray. Psalms 90:12 So teach us to number our days, that we may apply our hearts unto wisdom. Ecclesiastes 12:3 describes the winter of our lives which should be a time of faithfulness. I’ll admit, the winter is not a season I look forward to. Here in Ecc. 12:3 winter sound like a very difficult time. It is usually a time of difficult health issues and low energy. The elderly sometimes feel lonely and forgotten. They, because of declining health cannot do the things they had previously done. This can be depressing. They through life have acquired much knowledge, but many times no one wants to know an appreciate the benefits of their wisdom. So there is no one to share what they have to offer. They may therefore fell unappreciated and lonely. Because of their physical health issues they sometimes are fearful and vulnerable – they know that they would not be able to fight off intruders and they would not be able to fight off intruders and they would not be able to run either. But remember Psalms 46:1 God is our refuge and strength, a very present help in trouble. The winter of our lives is also a time of reflections. Because of the manner in which we have lived our lives, that reflection can be a time of joy or a time of regret and worry, of how things might have been. Therefore burdens may weigh down the elderly even more than the physical and emotional distress they are already experiencing. There is not time (or energy) to go back and undo their lives. That is why it is so important to redeem the time (Ephesians 5:16 Redeeming the time, because the days are evil.) and make the most of every opportunity AT EVERY STAGE OF OUR LIVES. The winter is hard – we especially need God and others need to see our faithfulness through the long hard winter’s difficulty. Proverbs 16:31 The hoary head is a crown of glory, if it be found in the way of righteousness. Fear God – It is not a trembling, scary feeling. It is an honor, a respect, an awe and reverence because of who He is – what He has done. We should respect and love God, and in doing so we will want to please Him. God wants us to enjoy the blessings He gives at each stage of lie, but we are to keep in mind we are never exempt from obeying His commandments. We are answerable to Him at all stages of our life. If we have remembered our Creator in the days of our youth (Ecc. 12:17) and onward, we will have lived a worth while life. God will be pleased. The success or failure of our whole lives depend on whether we fear God or not. And our fear is evidenced by our obedience to His commandments. Let’s determine NOW in whatever stage we are in to conclude our lives by loving and fearing God and to finish our lives in FAITHFULNESS to Him. I have also included the rest of the pictures that were taken that day.